Syarifah Iis Aisyah Department of Agronomy and Horticulture, Bogor Agricultural University, Indonesia. Khotimah Khotimah Department of Agronomy and Horticulture, Bogor Agricultural University, Indonesia. Krisantini Krisantini Department of Agronomy and Horticulture, Bogor Agricultural University, Indonesia. A wide range of imported ornamental sunflower seeds have been marketed in Indonesia. 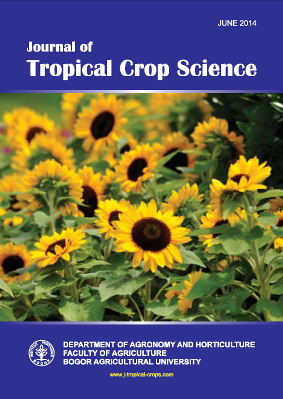 A field evaluation was conducted on seven sunflower cultivars to investigate their germination, growth and development in humid tropical environment in Bogor, West Java, Indonesia and to determine their potential uses. Most of the tested cultivars, except for ‘Sungold Double’ and ‘Velvet Queen’, demonstrated good germination and growth. ‘Eclipse’ was highly susceptible to stem rot, which resulted in only 30% of the plants survived. ‘Little Leo’, ‘Teddy Bear’ and ‘Sungold Double’ were naturally compact, dwarf, and produced attractive blooms so they might be suitable as pot plants. ‘Hallo’, ‘Velvet Queen’, ‘Sunburst’, and ‘Eclipse’s plant height were more than 100 cm, had long stem and large blooms. These cultivars might be suitable as landscape plants.